200 newsletter issues, thoroughly researched, written and edited by the SmashingMag team. We’re celebrating today’s issue by highlighting a part of the team behind this magazine. When we share our lessons learned, we can’t predict who is going to read them, but it can make all the difference in the world. I still vividly remember that day when I received an email from a school teacher in Johannesburg, South Africa, five or six years ago. 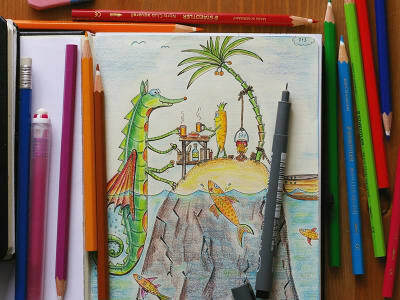 Back then, they didn’t have any teaching materials available at their school, and interaction design was often taught on paper with a few outdated books from the 90s. In that particular email, the teacher wrote that he and his colleagues would print out a different Smashing article every day about interaction design, usability or anything related, and that would be used for discussion and lecture material during class time. I was deeply moved by his kind words, and it suddenly gave our work here at Smashing a very different meaning and a very different purpose. It’s that purpose that still drives my wonderful colleagues every day to produce meaningful, relevant, bulletproof content, and it’s that content that also finds its way into this very Smashing Newsletter. I couldn’t be more proud of our team and the work we’ve been doing, and I’m incredibly lucky to have a team of people I trust and can rely on. It’s a privilege not everybody has, and I appreciate it every single day. Today is the 200th issue of our precious li’l Smashing Newsletter, and in this issue we’d love to highlight the people behind this little project — the entire team, writing and editing and proofreading and pushing that damn “Send” button. It’s the lessons we’ve learned and the experiences we all shared during all this time, and it’s the people who try very hard to provide a little hint or technique that might help you every now and again. You never know the impact of your work, so keep doing what you believe in and don’t underestimate it. You might make all the difference in the world to somebody one day. Thank you for your support. It means the world to us! When I joined the Smashing team back in 2012, one of my first tasks was to write a post for the newsletter. I don’t remember the topic but I do remember that I was so proud that my little piece of text would be read by tens of thousands of people. Since then, the newsletter has been accompanying me. Every two weeks I get to dive into all the cool stuff the web community brings forth, and each time anew, it’s impressive to see people so passionate about their work — and about sharing it with others. Now, after 200 newsletter issues, and more than 120 I contributed to, I asked myself if there’s a topic I liked particularly in all this time. The truth is, there were still oh so many inspiring, thought-provoking, useful, and sometimes even funny things that stuck with me that calling one a favorite just wouldn’t be fair. Every piece has been a little gem, and they wouldn’t exist without you. So, dear community, please keep up the fantastic work — it’s a pleasure, and always a little adventure, to help spread the word about the cool things you do. I couldn’t possibly write about all the things that I have learned throughout the past five years being here at Smashing; oh boy, there’s a lot. The love for the attention to details. The passion to make everything we do so thoroughly. I started coding, and I grew into many new areas I didn’t expect to end up when joining the Smashing family. What baffles and humbles me the most, however, is what people think of Smashing and what a big company we must be. We are not. We are tiny, with less than 20 peeps altogether, and with a small office in our hometown Freiburg, Germany. No table tennis in the office, no free and fancy catering, no big buildings or campuses. All of us are just really normal, hard-working, humble people. Most of us work from home, many of us part-time and in addition to our regular jobs. Some of us have kids, some of us need to care of their fragile parents. We are not really that special at all. 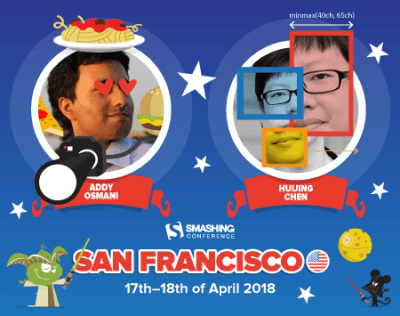 With our third SmashingConf San Francisco taking place at the Palace of Fine Arts on April 17 & 18, we want to explore strategies for making outstanding and fast experiences, and what we all need to know today, to be more productive and make smarter decisions tomorrow. I still feel very much like the newbie to the team, coming on board as Editor-in-Chief at the end of last year. However, I’ve been working with the Smashing team for several years. 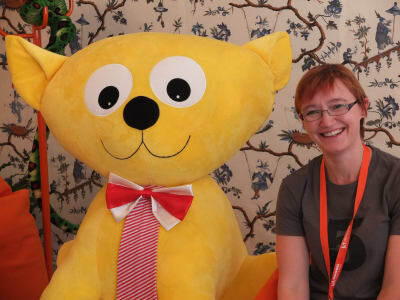 I spoke at the very first Smashing Conference in Freiburg in 2012. My first Smashing Magazine article was in 2010 on “Getting Started With E-commerce”, and I knew most of the subject editors due to being part of the review panel. I’d just like to say thank you to the rest of the team for making me feel so welcome, even while diving out the way as I try to organize all of the things! I love being part of Smashing, I read every single article, and am introduced to technologies and ideas that are new to me every day. There can’t be a better role for a person who really loves the web, and the way it helps us communicate with each other. People always ask me how did I get involved with Smashing Magazine. It never fails. But it is a very simple story. Back in 2010, Vitaly tweeted that they were looking for writers. I replied the tweet and we started talking by email. I sent my first article, almost finished. It needed some more tweaks and editing. To my surprise, one day I found myself clicking on a link, started reading this piece, and I realized that it was my article that had gone live! From then on, Vitaly would send me articles to review. Little by little, I got more involved in the editing and review process. The people I have met at Smashing are nothing less than smashing. I treasure these friendships. Some I have never met in person but we care about each other to help each other grow. If you imagine just the huge amount of people who are reading what is published on Smashing Magazine day by day, or what is broadcasted on Smashing TV now, or the amount of folks who order and read Smashing books, or how many people have been attending the Smashing Conferences since 2012, and so on; if you just imagine that amount of people, you can easily get frightened. Not only about the sheer amount, but also about the responsibility that comes along with this. Being aware of these facts and taking the responsibility to create what is published through all of these channels is fantastic, and even though I am a small part of this, my hat’s off to everybody else who is shaping Smashing day by day. The biggest challenge is to keep up the good work. To fulfill and meet expectations of new and returning people. No matter if we speak about new books, articles on Smashing Magazine, newsletters, events, or whatever. Happy to work on making the experience at least as good as the last one — if not better. I first started working for Smashing Magazine as an expert reviewer back in 2012. It was an honour to be asked. Smashing was founded just as I left my regular job and started out as a freelance web designer, and by the time I joined the panel I’d been reading articles published there for a while. It was a great source of information and inspiration. In December 2012, at my first speaking gig in Leiden, Netherlands, I met Vitaly and that really helped cement my relationship with Smashing. As the nature of my work changed, from designing websites to editing books about designing websites, it seemed a natural progression to help edit articles on Smashing, and then edit books. I’ve worked on Smashing Books 4 and 5, and I’ve been able to help authors like Alla Kholmatova, Paul Boag, and Heydon Pickering with their books. The team at Smashing are all very talented and friendly, and they’re committed to publishing writing that any web developer will immediately find useful. Right now, I’m busy with Smashing Book 6, and I know there are more great titles to come. After reading Smashing Magazine for a decade during my former career as a web designer and developer, today I am delighted to be a part of the Smashing community as the SmashingConf Partnerships & Event Manager. On 2015, I carried (the heaviest) Smashing Book 5 from London to Berlin for Vitaly to sign and proposed to bring SmashingConf to my beloved city Barcelona. Vitaly liked the challenge and we met at the Palau de la Música Catalana a few days later to plan for our first event together! Since then it’s been 12 amazing events that feel more like a family reunion for me. It is so much fun to turn the the online magazine into the conference experience (from bits to atoms) alongside our amazing team and partners and traveling with the crew. This year we added two new locations to the roadshow — exciting! As someone who had always been a reader of Smashing Magazine as part of the development and growth of my career on the web, I jumped at the opportunity to contribute back to Smashing Magazine as part of the editorial team. It doesn’t sound like much at all, but being assigned an article for the first time was a memorable experience for me, because it made it legit that I was a part of team Smashing. It was a different experience to be on the editing and publishing side of things versus being an author. It’s truly eye-opening to experience what goes into publishing an article, and the coordination between team members across time zones and geographical regions is what makes this special to me. The web is global and I think Smashing Magazine represents that really well. I’m really glad to see Smashing Magazine hit yet another milestone with this 200th newsletter and I hope there will be many more 100s to come. 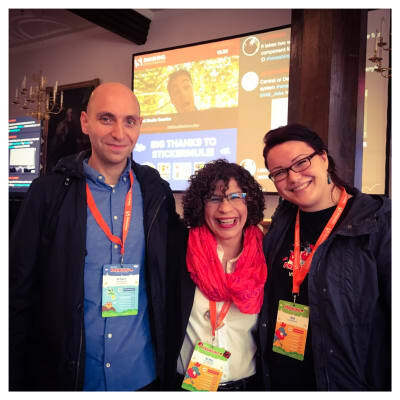 At SmashingConf, inclusivity and diversity are forefronts in our minds. We work hard to bring speakers from all areas of web design and development, we aim to find new solutions to old problems, and most importantly, we aim to make everything we do available for everyone. Allow us to introduce the Smashing Diversity program. Each conference, with the help of some of our Smashing speakers and our friends at Google, we'll be sponsoring three conference tickets and three workshop tickets for someone who can't attend without assistance. And, with your help, that’s just a start. Very soon, you’ll see a donation button when you go to your cart. If you feel the desire, add a few dollars, and you can help further the career of a young student, a charity employee/volunteer who’s looking to further their cause, or someone who wants to expand their horizon but can't do so because they need a small helping hand. Interested in applying? Please head over to our Typeform and answer a few questions. All successful candidates will be notified at least 2 weeks before the upcoming conference.